Senate President, Dr. Abubakar Bukola Saraki has pledged that the Nigerians in Diaspora Commission Bill currently before the National Assembly would be given accelerated passage to enable Nigerians living outside the country the opportunity to participate in events within the country. The Nigerians In Diaspora Bill when passed would facilitate the establishment of the Diaspora Bond for the in-flow of Foreign Direct Investments (FDI) into Nigeria among other benefits. The Senate President spoke yesterday when he received a delegation of Nigerians in the Diaspora led by its Worldwide Coordinator, Dr. Camillius Konkwo, at the National Assembly. 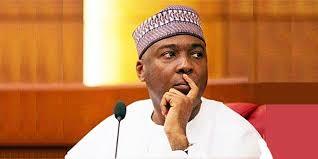 According to a statement by the Special Assistant to the Senate President on Print Media, Chuks Okocha, Dr. Saraki assured that the Nigerians in Diaspora Bill would be passed as soon as possible saying , " though the Senate has suspended its plenary session to February 21 to enable the quick passage of the 2017 budget, your April 2017 deadline could be met as the Senate would pass the bill by March 2017. He told the NIDO delegation that the bill has already passed it's first reading at the Senate. "On the NIDO bill, the National Assembly will partner with you as it is part of the Made in Nigeria Campaign which is to patronise and prioritise the purchase of Made in Nigeria goods by the Ministries, Department and Agencies (MDAs). "Government agencies spend as much as N2.1 trillion annually and if the MDAs spend up to 30 percent of their expenditures by patronising Made in Nigeria goods, it will go a long way to stabilise the economy and grow the Naira", Dr. Saraki said. On their request that the electoral act should be amended to enable Nigerians in the Diaspora vote during elections, the Senate President told the delegation that the Electoral Act is almost 95 percent concluded, but said that since the amendment of the act is an on going process that the National Assembly would still look into their request to vote during elections. Earlier, leader of the delegation, Dr. Konkwo told the Senate President that official statistics showed that Nigerians in the Diaspora contributes over $35 billion to the economy through remittances, but unofficially that the remittances are three times more than the official figure. He appealed for visa waivers for foreign investors coming through Nigerians living outside the country, advocating that there should an official data of Nigerians in the Diaspora by directing the National Identity Management Commission (NIMC) carry out a data capturing of Nigerian outside the country. He commended the Senate President for his leadership intervention especially in championing bills that would help grow the economy and exist Nigeria out of the present economic recession.